Roti is a type of Indian flatbread that comes in many different types and flavors. .This is usually served with stews such as curry or baigan choka. Its very popular in India and parts of the Caribbean. In Guyana it is very popular as a breakfast item. 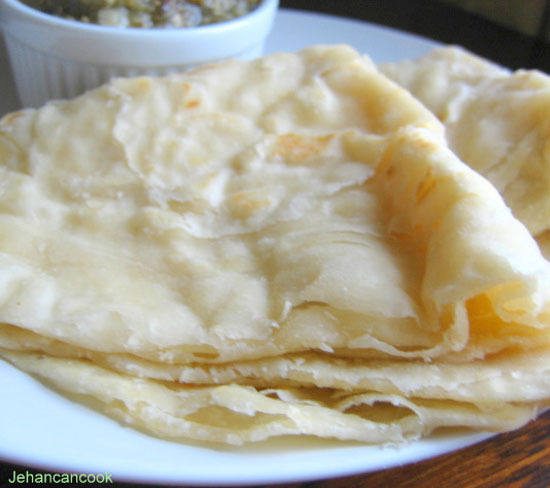 Today I’m sharing my mom’s recipe for paratha roti. I will attempt to demystify this simple but complex dish. My mom makes the best Roti so when I decided to make this, I called her up in the middle of her lesson at school. I knew that her recipe would come out perfect as always. I gobbled this up today with baigan choka, this combination is a favorite of mine. Mix flours, salt and water to form a soft dough. Knead until smooth and let sit for 15 mins. Roll dough into a rectangular shape about 1/8 inch in thickness. Place oil and shortening together in a bowl. Spread oil and shortening mixture liberally over the dough, making sure entire surface of dough is oiled. Starting from the longer end, roll dough tightly( similar to the way roll the dough when making cinnamon rolls). Slice into six pieces. Tuck the loose end of dough in the top of each roll. so it doesn’t open up and let sit for at least half hour. Traditionally this is cooked on a tawa but for those who do not have one can use a wide frying pan or crepe pan. Place tawa on a medium fire. While the pan heats up roll out the dough to a flat, thin circle. Place dough on an ungreased pan and cook for 1 minute, then flip. Liberally brush the oil mixture on the roti. Flip. Now brush the other side of the roti with the oil mixture and flip again. Cook for an additonal minute, then take off the fire and place in a covered bowl. Shake in covered bowl vigoruously. This will make the roti fluffy and should reveal the layers. Continue this process until all the roti is cooked. Enjoy this with curry, baigan choka or just by itself. Previous Post Baigan Choka or Roasted Eggplant…my love. Oh goodness…we’d need someone to make this for us. Looks so good, but seems intimidating! And yours look perfect! My mom used to take the initial dough and portion out each ball. Then she’d roll out each ball, put oil, and then fold it up to make the layers. Then she’d let that rest and then follow the rest like yours. Your method is so much easier! I can just roll it out once, and the balls are already round! Brilliant! Yeah that’s how my mom makes hers too, but this is a quicker method and I thought it would be easier for readers to follow the instructions. I’ve never had this before and it looks sooo good! I’d like to try this myself! It seems to me that no matter what type of food our mother’s prepared, we have found quicker methods in order to keep those traditions. This looks exquisite! Congrats on the top nine. Those look nice and light and flaky and good! You have to make some roti for me soon. I’ve been wanting to try making roti, and yours looks fantastic! Sounds great with the eggplant too. I love roti. When I was in college, one of my friends got food from her mother every week, such as a lamp dish, a side and roti. I loved getting a taste. I make roti without any kind of shortening. If the dough is mixed soft and put to rest for half an hour before cooking, it becomes easy to handle. Small amounts of olive oil can be used for a healthier roti…when making them into rounds and also for cooking on tawa…end result is the same soft and flaky roti. I absolutely love the “look” and “feel” of your pictured roti! I recently just made something similar to this but I think the recipe that I used could use a bit improvements, but I’m no expert on making this beautiful “bread” so I’m going to keep on searching and trying different ones. The type of roti that I personally like is a bit “sweet” (?) And it is incredibly flaky. I don’t have shortening at hand, but do you think I can use “lard” as a substitution? It can absolutely be substituted! Shenaz I used Crisco, but you can also use ghee. Thank you for the compliment, the best tips I can offer is to make sure not to cook the roti too long or else it becomes crispy. As for the layers, when you roll out the dough and place oil on it then roll it back up, that’s what creates the layers. Make sure you are leaving it to sit for at least 15 mins, the longer you leave it the better. Thanks for the recipe. I am making them right now, they don’t look like yours but I think they look great for a first time and having to run btwn the kitchen and 8mos twins.I will def make again. I did end up using extra water about a cup should I be kneading more to avoid that? A cup of water is a lot. I use this recipe all the time and I always get the same results. The only thing that could be a factor could be your measuring cups. Yes, I know it sounds ridiculous, but not every cup measurement is exactly the same. Kevin I’m assuming this will make the roti even more tender, thanks for the tip. I will try it the next time I make some. I just made this roti with some hot chicken curry. O.M.Gosh. . .layer for layer, the best recipe I have tried! Thanks Jehan, you make it easy for a generation that has watched their mothers throw ingredients together without a measuring cup, never sure how we were going to catch up. Carla if the roti has brown spots its been cooked for too long and it will harden once cooled. Turn the fire down and don’t leave in on one side for too long. For the first time ever my paratha roti came out just the way I wanted it to. I remember vaguely that my mom oiled the Tawa before frying..does that make a difference . Roti is one of my favourite dishes but I never seem to get it right ..always a tad too stiff and not as leafy as mom’s. Joe, I’ve only made it one way and that’s without oiling the Tawa so I’m not sure if it will make a difference. I’ve been trying my hand at roti. I stumbled across your site when looking for reasons why my roti comes out hard. I think my fire may be too hot and also I’m cooking it too long. Next time I make it, I’m going to try your recipe. I had one question. I see the recipe calls for 3/4 cup veg oil plus 1/4 cup shortening. Does all of this go on in the oil phase or do you reserve some for brushing the roti in the cooking phase? If so, how much of the oil mixture do you reserve for cooking? Thanks so much! In the oil phase you use enough to cover the dough. If more oil is needed when your brushing the roti just add more. Thank you for sharing your recipe. I made it using your site and it was so soft. I just made your roti and it came out pretty good except the parts with the brown spots are crispy and after a while the whole roti gets crispy.Can you think of what i could be doing wrong? Not enough oil when cooking? rolling to thin? Hi Tramine, it could be a number of reasons. Your roti could be overcooked or the heat is too high. And yes the brown spots do become crispy once cooled. Also try not to roll the roti too thin. I hope I have helped answer your question. 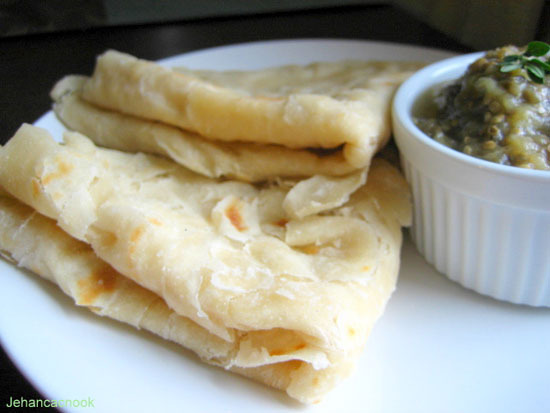 I travel yearly to Trinidad and have roti often but have never tried making it. This site has inspired me to do just that. I also love doubles and always visit the shops for some on my trips. On of my favourite dishes is “curry goat”. drool drool, wish i could personally taste what’s in the photos. You’re welcome Melly! Thanks for visiting, I’m love getting feedback from my readers. Jehan, I absolutely love your recipes! I’ve only tried a few thus far, but whenever I have they always turn out great! Quick question, when you say 1/4 cup of shortening and 3/4 cup of oil for the roti, that’s not just for one use is it? I’m assuming you use this mixture multiple times. Thank you for the kind words Tina. That amount will be more than enough. I gave a large measurement to ensure that u don’t run out of that mixture since you would need to apply it liberally when you’re cooking the roti. I usually keep the extra for the next time I make roti. Jehan, I did try your roti and for some reason mine never swells up..no matter if I use less or more baking powder :-/ it does however gets soft and flaky but never rises up when cooking on the tawa…why is that so? Thanks in advance! 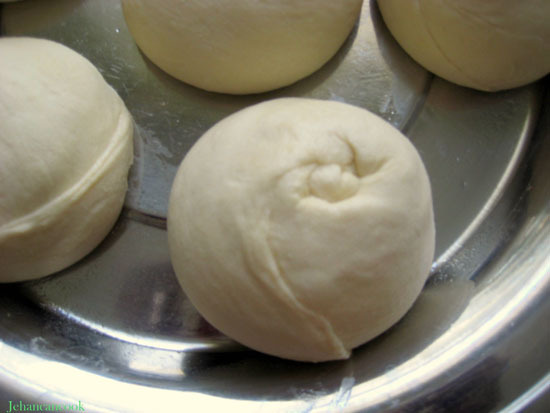 Hi Anjali, roti puffs up because of the layers that you created when you rolled it up with the oil. Also if the roti has a hole, it will not puff up. Do you see any steam escaping when the roti is cooked? Anjali, let me know how it turns out. Thanks for visiting! I ran out of oil so I had to use clarified butter. They came out pretty darn good! I’ll try it with oil next time and compare. I also put them in a zip lock and “clapped” it loose. Thanks for the recipe! Girl de ting so good me gon open me own restaurant call de dish Jehan curry and roti. Thank u thank u thank u. My mom makes amazing roti and you would think after all the years of helping her in the kitchen making roti, rolling dough, cooking on the tawa – even clapping with my bare hands – I would be able to make it myself. Unfortunately, I was beginning to think I missed the DNA from my mother! I will definitely try your method. (1) I never thought of using self rising flour – I always messed up the baking powder to flour ratio. (2) rolling up jelly roll style is brilliant! I was taught to roll out, cut to the radius and roll together in a ball (3) not clapping with your bare hands but putting in a covered bowl? Amazing! Not only saving your hands from extreme pain, but no mess! I will touch base after I make this to let you know how it turned out. You make us proud.. If you dont use self raising flour but the regular flour, what is the baking powder to flour ratio? Hi Ronald, thank you so much for the kind words. I am proud to represent us!! If you’re using just plain flour use 1 tsp of baking powder for this recipe. Thank you for visiting and for the support. I can’t wait to try your receipe because I love roti. I’ve tried to make roti a couple of times before (not using your receipe) and it has turned into a frisbee. I read through the comments and found that someone mentioned baking powder. In your list of ingredients I don’t see any mention of baking powder, how much do I need to use? Hi Amir, Baking powder is not needed in the recipe because it has self rising flour. Someone asked if they didn’t use self rising flour but all purpose flour, how much baking powder should they use. The recipe does not call for baking powder. Hi Jehan, thanks so much for your prompt response. I’m going to try to make roti tonight. I can’t wait!!!! Tried the roti today and they came out great. My technique needs some work (i didnt get circles until the last two) but they tasted great and were soft. What type of oil do you use? My mom who is an expert at this, uses ghee. My mom don’t measure anything so it’s hard to replicate he recipe. Thank you. Hi Jehan- I am in the same boat as Yadah who posted on 4/27/13. I can neverrrrr get this right and yours seem simple enough. however, today is my first time attempting it again after years and it already looks a hot mess. Can you PLEASE post pics of each step starting from “rolling the dough into a rectangular shape?” I totally lost all hope at that step!!:(…. My rolls look nothing like yours because it was really hard to know what it should look like after each step. THANK YOU SO MUCH. I WOULD REALLY LOVE TO TRY THIS AGAIN! Toni, if you google a recipe for cinnamon rolls you will see exactly how I rolled up the roti. I simply tucked the loose end into the middle like in the picture and let it sit. Toni, if you google the recipe for step by step Cinnamon rolls you will get a pretty good idea as to how I rolled it out. After cutting the roti into individual pieces, I tucked the loose end into the middle. The next time that I make roti, I will take pics of it step by step and post it. I did not try the pumpkin stew yet but I am trying your roti recipe tonight! It’s been years since I did that; not having to “clap” the roti is a plus. Will let you know how it turns out…. Your recipe was “spot on”. I followed your instructions to every detail and was not disappointed. Friday night dinner was great, I even made “baigan choka”. Thanks Jehan! Great job Skyy! Let me know how that turns out. Thank you for sharing your with us. I think it is great. Please can i have dhal puri? Hey Jehan, I have made these a few times and they have turned out well. My question is in relation to this statement “Tuck the loose end of dough in the top of each roll. so it doesn’t open up” Can you give a bit more detail as to what your doing here? Mine never end up looking like you uniform balls of dough. You do a great job Jeehan!!!! Keep it up. Hi, Jehan. I married a Guyanese man and I keep hearing about ghee. What is this exactly? My mother-in-law makes amazing food but I have never seen her use ghee on her roti. Who knows if it makes it even better?! I would like to give it a try, but this American girl doesn’t know exactly what it is. Thank you, for being amazing enough to create this blog. I showed my husband and he is excited about trying these recipes too! Ok so tonight i decided to make the Parathi Roti and they were a so delicious and fluffy!!! Last night i made the bake and filled some with cream cheese and the others with beef and veggies, and that as well was another delicious success!!! Thanks so much! Hi Shalenee, Thanks your for visiting and I’m glad you liked the bake. So sorry to hear that you’re having issues with the flour. I highly recommend using King Arthur’s self rising flour. Quick question, if i opt to use all purpose flour do you know how much baking powder i should use for 3 cups of flour? Yes I do! You can follow me @Jehancancook. Great recipe! 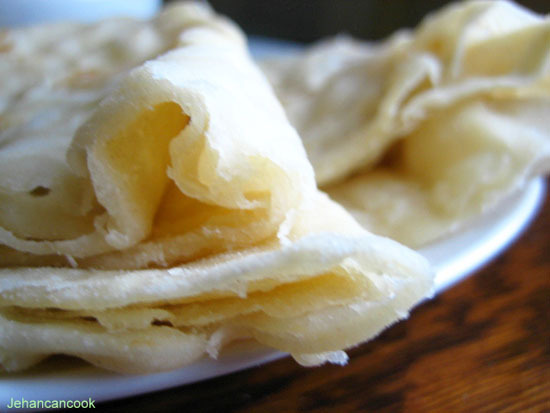 I grew up watching my grandmother make all kinds of roti, and this came out just like hers! The only changes I made was that I rolled out the roti with flour on the table and on the pin, and I grease the tawa between rotis, so you only have to flip it once. Yessss! I have wanted to try to make my own roit for the longest. And here you are, serving up a recipe that looks like it will definitely work. Thank you! I posted a comment asking a question about the roti I made and thus far have not seen my request or an answer. I have been faithfully following your website and have made several dishes. If you choose to publish only some of the questions asked, then I am afraid that I will have to look elsewhere for my recipes. However, I have been mostly successful with the recipes I had made previously before trying the Roti. Jules, I publish all of my comments. If I didn’t respond to you comment it is because I didn’t see it. Some of the comments are marked as spam and sent straight to the spam folder or trash. If you would like to reach me directly and receive a quicker response by all means email me at Jehancancook@gmail.com. Sorry for the confusion. jehan your new name from now on is “JEHAN MADE A ROTI MAKER OUT OF DEBS WITH ONLY ONE TRY. Thanks a lot jehan , at last ive done thanks to you, and please thank your mother for me too. i So far ive made paratha, dhalpuri and aloo puri all with sucess. yip one for those trying the paratha, when the dough is combined knead the dough only 10 to 12 times only then cover with damp cloth place in dark place leave to rest for 30 minitues. thats what worked for me try it out and see if it works for you. GOOD LUCK,AND JEHAN THANK YOU THANK YOU. Hi Jehan, Ive been married to my guyanese husband for 15 years and his mom is no longer here so no one to cook guyanese for him. Never made roti. Thanks to your website I am now making roti and chow mein for entire family and they love it (been enjoying your recipes for about a year now). You’ve demistified cooking guyanese by actually providing measurements. Wonderful thanks so much. This roti was delicious thanks for a great recipe. Thank you for sharing your mom’s recipe. My husband is India and I want to try to make this for him. I know he must miss eating it. I am planning to make it for lunch with duck curry on Christmas day. Your roti recipe and method really worked for me. I’ve tried many other recipes, but yours is the best. I only cooked two at a time, so the dough sat in the fridge for 3 days, and still good. Thank you for all your recipes. I saw your recipe and immediately wanted to try it….but had to wait for the weekend….lets just say…my son couldnt wait for me to finish…and my daughter said…how many did you make want another one…I havent made roti in about 20 years…thanks for sharing Jehan…what I like is the technique of roling like cinnamon roll. Can you tell me the recipe to make the roti with baking powder instead of self rising flour which I don’t have. Yasmin it’s 3 cups all purpose flour to 1-1/2 tsp baking powder. Christine what do you mean it was loosing?? You should call this recipe “Roti for Dummies” Absolutely perfect! Came out just like your pictures on the first try. I am totally amazed. Excellent instructions easy to follow. The cinnamon roll technique was great. Thanks to your mom too. Couldn’t even wait for my meat to finish cooking. I ate my roti with gravy from the pot! Simply the best. Many thanks for sharing this awesome recipe. PatC that’s so great to hear! Enjoy! Yum, Yum, your roti recipe is excellent. only difference , I use just a pinch of salt.. and add a healthy teaspoon of sugar. also I use ghee instead of your shortening. I love the aroma of ghee.